Commercial Mobile Altering System (CMAS) has been 10 years in development as an additional key part of the emergency alerting and warning system that already includes Emergency Alerting System, weather radio, phone notification systems, and outdoor warning sirens. The concept behind CMAS is that in an emergency, a 90-character text message can be sent at no cost to all cellphones connected to a pre-defined number of cellphone towers. Since many households have now chosen to use cellphones rather than a landline phone, CMAS fills the gap by sending geographically-specific messages to all mobile phones in a region. As noted in the Bulletin article from May 2012, local and state jurisdictions can use the system as an additional element of their local warning systems. It can be particularly helpful in reaching the general public quickly–including those with no hardwired phone or when outdoors. Since CMAS requires jurisdictions to use an IPAWS integrator, the use of CMAS will vary by jurisdiction. The investment in a system, such as online software that is compliant with the Common Alerting Protocol (CAP) standard, can be substantial. There are standalone systems as well as several of the popular crisis management tools that integrate a CMAS/IPAWS initiator into their systems–but all at a cost. Two unique issues are the very short message length coupled with the very broad reach–including recipients who are not local residents. Emergency managers and PIOs are likely to find it challenging to condense emergency guidance down to the 90-character (not words) limitation without redacting critical elements of the warning. It will take practice to draft CMAS messages. To improve efficacy, emergency managers and PIOs should consider employing pre-scripted messages in order to deliver the best message effectively in 90 characters. Additionally, state and local EAS and notification plans will require a significant rewrite to address the use of CMAS. Unfortunately, there is no national public education campaign to inform the public about CMAS messages and what to expect. Since currently less than 10% of cell phone devices are able to receive CMAS messages, there is likely to be some confusion when a CMAS message is sent but only a few phones in a room receive the message. In the Kansas City region, the regional EM committee and the regional PIO committee have developed a press release and flyer that can be used to educate the public. The press releases can be found at http://www.preparemetrokc.org/wea.asp. Due to the location of cell phone towers, it is likely that warnings will be received by unintended cellphones based on geography and warning type–which might prompt public frustration with CMAS. 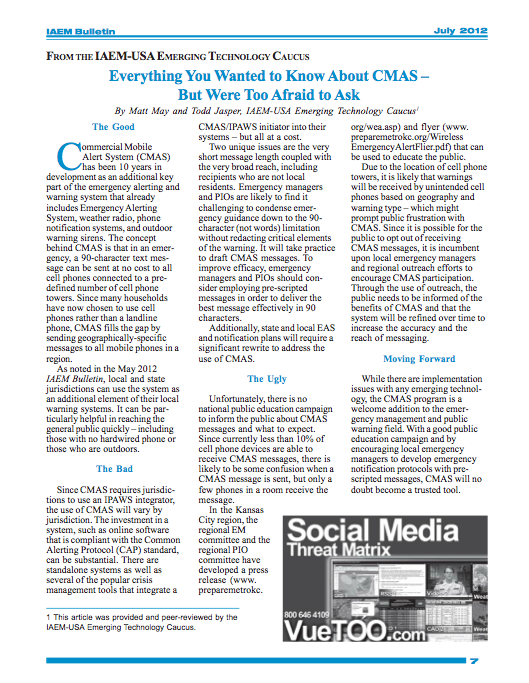 Since it is possible for the public to opt out of receiving CMAS messages, it is incumbent upon local emergency managers and regional outreach efforts to encourage CMAS participation. Through the use of outreach, the public needs to be made to understand the benefits of CMAS and that the system will be refined over time to increase the accuracy of the reach of messaging. While there are implementation issues with any emerging technology, the CMAS program is a welcome addition to the emergency management and public warning field. With a good public education campaign and by encouraging local emergency managers to develop emergency notification protocols with pre-scripted messages, CMAS will no doubt become a trusted tool.